As has been a consistent theme in our cup matches this season, Conte chose to make substantial changes. Perhaps understandable given the importance of our league fixture away at Liverpool on Tuesday night, coupled with the fact that we were at home to lower league opposition. It proved to be sound judgement in the end. I have to say I was expecting a little more from Brentford. Last time we faced them in 2013 they took us to a replay at Stamford Bridge after a 2-2 draw at Griffin Park that in all honesty we were lucky to come away with. Ok, we beat them 4-0 in the replay, but with a lot of first team players rested this time, and 6000 Brentford fans filling the shed, a tighter match wouldn’t have been a surprise. The reality was that this was a stroll in the park for Chelsea, to the point where you could question Conte’s logic in introducing Costa for the last fifteen minutes. Chelsea started in the usual system, but with vastly differing personnel. Begovic in goal, with Zouma and Terry alongside regular starter Azpilicueta, who was moved to left centre back. Fabregas and Chalobah started in centre midfield, with Pedro and Ake wingbacks. Willian, Batshuayi and Loftus Cheek made up the front three. Brentford went with a 3-5-2 setup, but enjoyed limited possession. Despite having an extra man in central midfield, they couldn’t retain the ball, and the spare midfielder had to drop so deep to get on the ball that it negated the advantage of having an extra body in there. 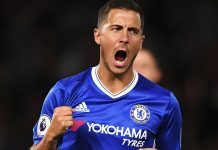 Chelsea started in positive fashion, and got the relief of an early strike. With possession half way in the opponents half in front of the west stand, Zouma had advanced forward to collect a throw-in. Upon being fouled, the free kick was played short into Pedro on the right end side of the box, who was also up-ended. Willian stepped up to take the free kick, and showing he has lost none of his dead-ball prowess from last season, bent it right footed into the net. Seven minutes later it was 2-0. Catching Brentford in transition, Batshuayi received the ball in the middle of the opposition half, and picked out Pedro with a low pass wide of the centre back, and he obliged with the finish after making his way into the box from the right hand side. Brentford hadn’t given up the fight, although they were badly bruised at this point. Struggling to string attacks together in the face of prolonged Chelsea possession. They managed to win a corner, and force Begovic to turn a flicked near post header around the post. It could have been three before half-time, but Batshuayi’s scrambled effort from a corner was saved on the line, and was adjudged not to have been over after the goal line technology gave it’s ruling. Into the second half, and although the score line might have appeared comfortable, you had the feeling that if Brentford could get one back it would be an altogether different match. Chelsea pinned they’re wing backs in their own half as the match went on, with Pedro and Ake both using the ball well, and providing a threat in the opposition half. Loftus-Cheek, playing wide in the front three, had provided extra help to cover the spare midfielder in the first half, and from an attacking sense, both he and Willian played narrow to make life difficult for the Brentford back three, who effectively had to match up man for man as a result. This forced their wingbacks to make a permanent back five to deal with the threat. Willian dropped deep to pick the ball up and serge past two through the middle, finding Loftus Cheek, who’s effort struck the cross bar. Fabregas was switching play nicely, while the backline were for the most part untroubled. As the match progressed into the last half hour, Conte made his first change. Replacing Willian with Ivanovic, and pushing Pedro into the front three. If the rumours are to be believed, this could have been the last appearance in a Chelsea shirt by Branislav Ivanovic, and if that proves be to be the case, he signed off in style. Yet again the ball was won in midfield, and Pedro advanced at pace this time, playing in the overlapping Ivanovic on the right, who drilled low past the keeper at the near post to all but seal our place in the fifth round. 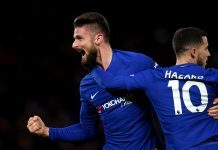 Kenedy, back from his uneventful loan spell at Watford, came on for Azoilicueta, and Costa entered the fray in place of the impressive Pedro for the last fifteen minutes. This heralded a switch to 3-5-2 with Batshuayi given the opportunity to partner Costa. 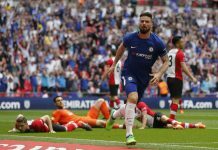 Costa played a ball into the advanced Ivanovic inside the final ten minutes, who was upended in the box, and Batshuayi despatched the penalty. In all honesty Brentford could have few complaints at the score line, and Chelsea advance into the fifth round draw. Willian, (Ivanovic 64), Batshualyi, Loftus-Cheek.